Zalul calls on the Ministry of Environmental Protection to expand the deposit law and apply it also onto the large containers (1.5 liters) that pollute open spaces and beaches, damage the landscape, harm flora and fauna and the entire public. Today, the deposit law is applied on small containers only, whose collection rate is more than 80 percent, and they have almost completely disappeared from the beaches and open spaces, while large containers continue to contaminate the environment. What is the Deposit Law? The Deposit Law, enacted in 1999, imposes a 30-agorot deposit on containers of up to 1.5 liters, but not on larger containers. Therefore, the purpose of the law, as defined, to improve the cleanliness of public space and to reduce the amount of waste buried, is only partially implemented. 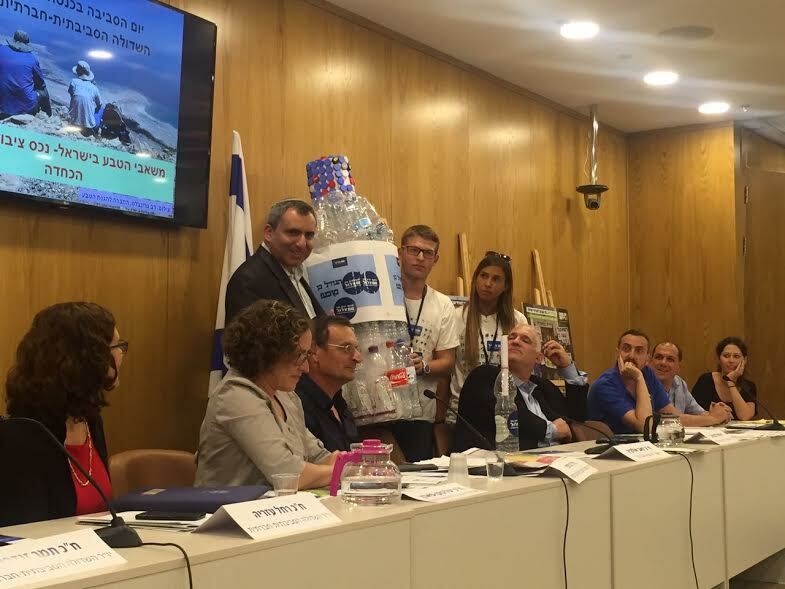 Over the years, attempts have been made to apply the law to large beverage containers, but these have failed because of the opposition of the beverage manufacturers, who are the owners of the ELA recycling company, who succeeded in persuading the ultra-Orthodox parties to support this opposition. Each year 750 million large beverage containers are produced in the State of Israel. 430 million containers are voluntarily collected by the public (half of them are collected from transit stations, while the burden of the cost of collection is on the public), whereas 320 million containers (!!!) find their way to the landfills, and at worst they are thrown on beaches and into rivers. There they are one of the most severe pollutants. Were any attempts made throughout the years to amend the law? In 2010 the law was amended, but even then it was not applied to large containers. Instead, the legislator set collection targets (originally, the law set a recycling target of 85%, after which the recycling target was changed to 77% and reduced to 55%) under "autopilot". In other words, if the manufacturers and the ELA corporation will succeed in collecting and recycling 55% (of the quantity sold in 2016), the deposit law will not apply to them. In the case they fail to do so, the deposit will be applied beginning 2017. And indeed, according to the manufacturers, the rate of collection of containers stood at 54% in 2015, while in 2017 it was 57.5%. Hence, they should not be placed under the Deposit Law. In addition, the Ministry of Environmental Protection announced that it was considering canceling the "autopilot" clause and subjecting treatment of beverage containers to the packaging law approved in 2011, since the packaging law is efficient enough and therefore no deposit is required. The Minister of Environmental Protection is scheduled to decide on the matter. Has the Ministry of Environmental Protection examined ELA’s data? The data presented by ELA Corporation have not been examined or analyzed by the Ministry of Environmental Protection, so there is a reasonable chance that they are not correct and in practice are intended to serve the purpose of the corporation that opposes the expansion of the Deposit Law. A survey conducted by “Maagar Mochot” based on 276 recycling cages (Ordered by Asufta – a collection company that supports the expansion of the law), determined that the response was only 35%, and that a large proportion of the recycled containers were not those of drinking but of other products (ELH corporation denies this). In Pareto company’s opinion, which did work for the Asufta collection corporation, the response rates are even lower, and in any case they contradict European data where the voluntary collection is only 20%. By ELA’s data, collection is conducted by 24 thousand recycling cages scattered around the country, to where the public voluntarily brings the bottles. 2 percent is collected through and orange recycling bin and half is collected from transit stations. It is important to emphasize that a bottle that has arrived at the transit stations has cost municipalities a lot on the tax payer’s money, and as such, cannot be defined as “voluntary collection”. In most western countries, the US and Australia among them, a deposit law coincides with a packaging law. In some of the countries a deposit law was enacted after a packing law had existed already (In Germany the packaging law was legislated in the early 90s and the deposit law in 2002, where recycling collection target was set at 72 percent. Today recycling collection stands at 90 percent). A study conducted in the United States in 2014 found that the rate of return in countries with a deposit law is 80% -90%, while in countries where there is no law, it stands at only 23%. What is the rate of return for small containers included in the deposit law? The collection rate is 80%. Where out of the 5 billion beverage containers sold between 2002 and 2012, about 90% of the containers requiring deposit were returned. Nine times more than the return of the containers that did not owe the deposit. The best proof for law succeeding is the fact that small containers have almost completely disappeared from the sides of the roads, the rivers, open spaces and beaches, while large containers are languishing everywhere. Is the claim that a deposit raises the cost of living correct? The deposit is not a surcharge, since the consumer has a way to get his money back. Not only that, an inspection has revealed that the deposit caused a decline in the price of the product, since the manufacturer absorbs part of the deposit, so that who ever returns the container gains the reduction in the price of the product. Studies also prove that deposit does not cause a reduction in product use. In particular, a deposit encourages sustainable conduct and internalizes the external costs caused by the purchased product to the environment and to the general public. This argument has not been proven. What is certain is that the collection of small containers has become a source of livelihood for quite a few people who collect the bottles and return them. It is reasonable to assume that these people find it difficult to earn a living in another way. Following the decision of the Minister of the Environment, Ze'ev Elkin, not to expand the deposit law onto large beverage containers, "Zalul" will appeal to the court demanding that it determines whether the Minister took a decision which is under his authority. Zalul believes that in his decision not to expand the deposit law and not to apply it to the large bottles, Ze'ev Elkin, in his role as minister of environmental protection, had damaged the public trust by predilection of foreign interests over environmental & the public’s interests. These harsh words must be said after it turns out that Minister Elkin preferred ignoring conclusions stated by CPA Yamin Georgi's report, which his office had ordered, explicitly stating that the recycling corporation ELA did not meet the recycling target, and chose to adopt the corporation's reports which proved to be, to put it mildly unreliable. This raises the suspicion that Minister Elkin had already foreseen the goal, which is the non-application of the law, thereby harming the interest of all of us. The deposit law was legislated as an environmental law whose primary purpose was to make the public stop throwing beverage bottles in open areas and beaches and return them in exchange for the deposit. The beverage manufacturers opposed the law and convinced the religious parties that it would make the drinks more expensive. These caused the law to be applied only on small beverage bottles, and as for large bottles, the public was requested to voluntarily return them through ugly recycling cages placed on pavements at the expense of the public domain. The Minister of the Environment was required to examine the performance of the corporation as of 2016. If the rate of return does not exceed 50%, the Minister will be asked to expand the law automatically. However, contrary to what was expected of him, and despite the data that clearly showed that the ELA corporation did not meet the task, Elkin decided not to fulfill his duty and not expand the law. According to the data by CPA Georgi clearly indicating that contrary to claims made by the ELA corporation showing they managed to collect 60% of the containers, they only managed to collect 44.13%. Not only that, contrary to the corporation's claims that it managed to recycle 100% of the containers, the data from CPA Georgi show recycling of only 30%, far from the 80% target set by the Ministry of Environmental Protection. In his report, CPA Georgi states that the corporation intervened in the data by deciding on his own that the weight of the bottles was smaller, thereby causing a deviation in results for his benefit. The corporation's reports were not accompanied by documents and in some cases duplicate reports were made. His recommendation to the Ministry of Environmental Protection was that data on the weight of the bottles would be received from an authorized entity other than the corporation. In other words, the accountant's office appointed by the Ministry of Environmental Protection himself did not believe the reports of ELA, while the minister was prepared to rely on them blindfolded. Not only that, but in order to explain his puzzling opposition to the law, Elkin claimed that "crime families" took over the collection of small bottles and therefore should not be allowed to expand their businesses. Unfortunately, the Minister of Environmental Protection did not even think for a moment that crime is being dealt with by the police, but by harming the environment.